Bringing to market a fair priced range of compostable & biodegradable takeout containers, plates food service and packaging products for use in companies, schools, cafeterias, and restaurants. We carry sugar cane plates and takeout containers, disposable utensils and cups. Included are PLA cups and containers and bioplastic bags. We are a Honolulu, Hawaii based organization that provides environmentally sound alternatives to Styrofoam. 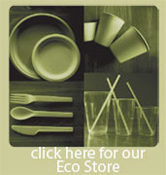 We supply sustainable products, including biodegradables for everyday consumption choices. Non-petroleum based products which reduce the impact of our consumption on the environment. Raising awareness of compostable disposables made from readily renewable resources like sugarcane, reed grass, corn & potato. Bringing to market a fair priced range of compostable & biodegradable takeout containers, plates food service and packaging products for use in companies, schools, cafeterias, and restaurants. We carry sugar cane plates and takeout containers, disposable utensils and cup. Included are PLA cups and containers and bioplastic bags. We are a Honolulu, Hawaii based company that provides environmentally sound alternatives to styrofoam.